The pathway from the conception of an idea to its fulfilment is often complex. So it was when a casual remark by Norma De Marco in the Hand ond Shears culminated in a musical offering at a triple beatification ceremony in the Vatican. This pathway encompassed the setting up of an Anglo-Italian research fund into diabetic vascular disease, and the retracing of Rahere’s visit to the Island of Tiber. The latter was celebrated on the Island by a concert at the Church of S. Bartolomeo, and a symposium at the Hospital of the Fatebenefratelli. The visit cannot be said to have passed without incident: individuals left temporarily behind in each airport must have shared Rahere’s forlorn hopes of survival, as must a wandering cello on an all expenses paid, unscheduled trip to Addis Ababa in the hold of a DC10. The medical might of the group was powerless against a virulent strain of Asian flu and the European tummy which threatened to take the edge off some remarkably beautiful performances. We fortunately recorded only one broken limb and not too many lovers’ tiffs. Incidences such as the temporary loss of music, or of black shoes and trousers, we usually negotiated satisfactorily. The goup tolerated changes in travel agents, quotations and moves from monastic to pensione accommodation with great forbearance: it is doubtful whether Rahere had bath plugs, loo seats or constant hot water either. The concerts could not have been sited in three more architecturally diverse venues, but all were so beautiful. The murals adorning the walls of the Church of S. Bartolomeo portrayed the life of the saint, particularly his grim death, being skinned alive. The sanctuary was set at a higher level than the nave, and the choir were seated around the sarcophagus containing the remains of the saint. The acoustics were excellent and a large audience, many standing as the church was only about twice the size of the Great Hall, were treated to a wealth of musical detail in the programme, which included the Nelson Mass.. The exterior of the Church of S. Ignazio resembles that of many other slightly tarnished Roman buildings, but its interior was magnificent. It was difficult to accept that the arched ceiling and high dome were a mere optical illusion portrayed by the artist’s brush on a flat surface. The organ, with it mobile console, was one of the finest in Rome. Had we but known of its six-second time lag, Bach might have received more prominence in the programme. Nevertheless, Handel held fast, both in John Dickinson’s rendering of an organ concerto and the Coronation Anthems: one doubts that the Master would have been displeased with the results. 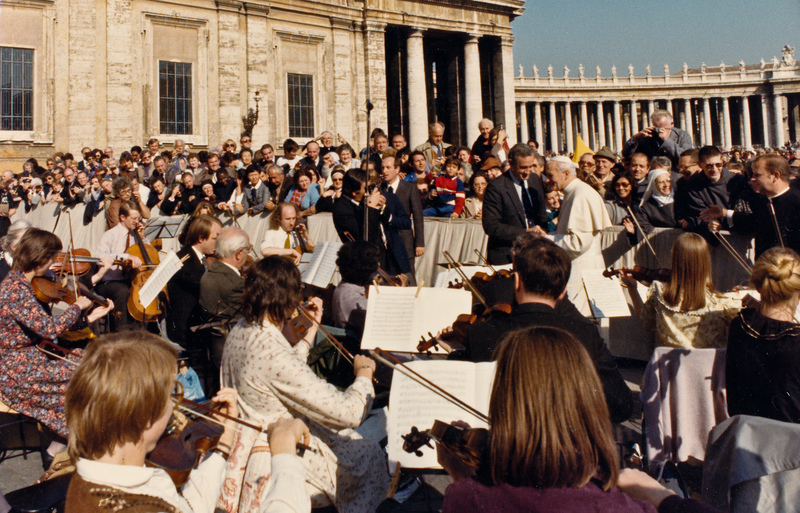 The performances in the presence of Pope John Paul will remain lifelong memories for all members of the group, regardless of their denomination. All were deeply moved by the warmth of feeling that emanated from his presence. Our rendering of Zadoc at the Wednesday papal audience, with its amplified echo effect through the loudspeakers across St Peter’s Square, could not have been surpassed. 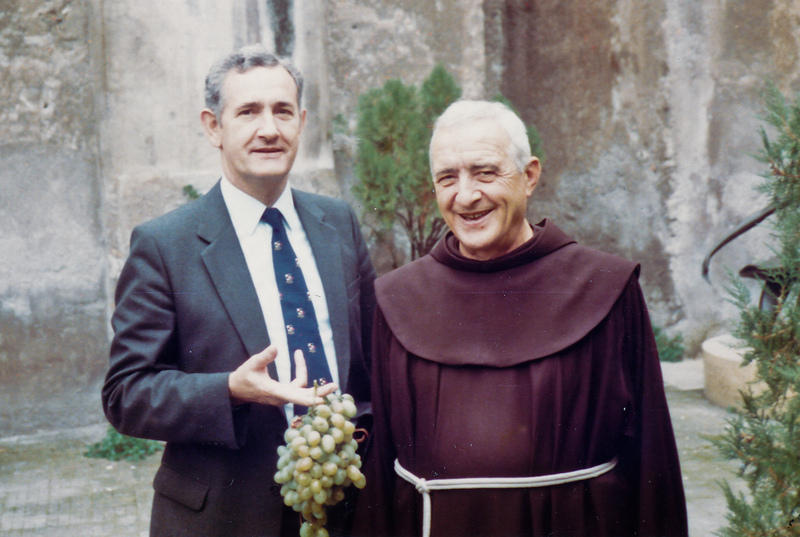 Involvement in the beatification ceremony on the Sunday swelled our audiences by a further thirty thousand. It was our first experience of Roman rain, and the spectacle of cardinals raising appropriately coloured umbrellas,and priests donning their plastic cape-hoods. The visit also encompassed the fountains, gardens and churches of Rome, and the Cistine Chapel; the combined splendour of which bordered on the improbable. The event set a standard for tours which was unlikely to be surpassed, and an experience that is unlikely to be repeated by other Barts pilgrimages; at least, not for another eight hundred and eighty years.